This is my first attempt at id'ing small braciopods and coral. Could you please give some input on if I am wrong or right. 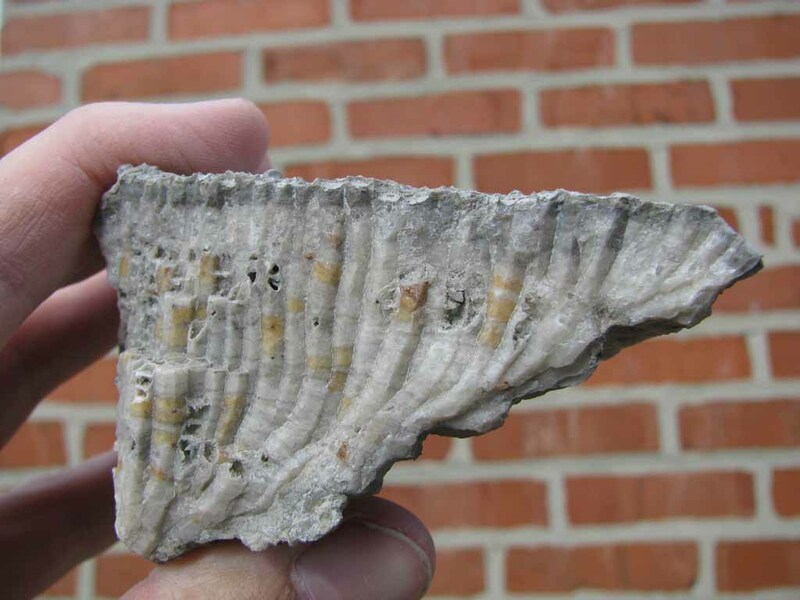 They are all from the Devonian period from the Schoharie NY roadcut. 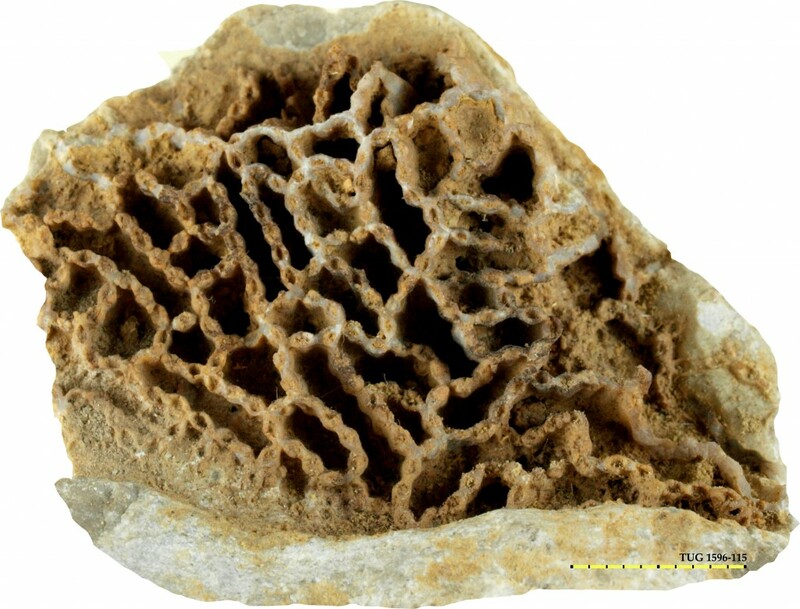 The last corals are from the uppermost section of the Becraft limestone. the fact that you could put any name to them is miles ahead of my Devonian knowledge. Good job. I think your coral may be Favosites sphaericus. Your other ID's look pretty good to me - Maybe @erose will have a look see. Jay may have an idea since he is close! Possibly - but Jay may be more familiar with the Middle Devonian fauna. This is Early Devonian, about 4 hours east of where Jay is at. Erich has extensive knowledge of the Schoharie area. Bah the Devonian only covers what...60mya? I am definitely more familiar with the middle Devonian, but I've been buffing up on NY's Devonian lately thanks to Amadeus Grabau's awesome publications. The first brachiopod definitely looks like a Strophonella sp., but I wouldn't know which exact species in that area. Most of the others look plausible as well. The coral looks more like a Halysites sp., perhaps catenulatus? The Amadeus Grabau publication on the Schoharie Valley just so happens to be available for free through Google books! 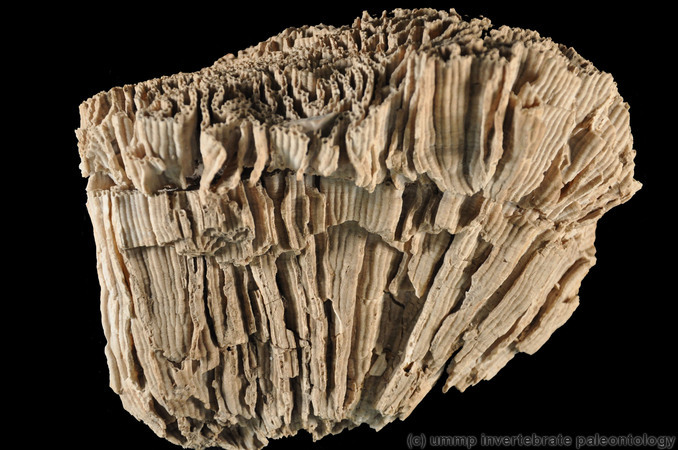 It's clear (in side view) that the corals are tabulate corals, but I think, a top view of them would help to see the distribution of the corallites. Could you take a photo from the upper side? The coral Dom posted doesn't appear to have the chain like appearance of Halysites, ... to my eyes. 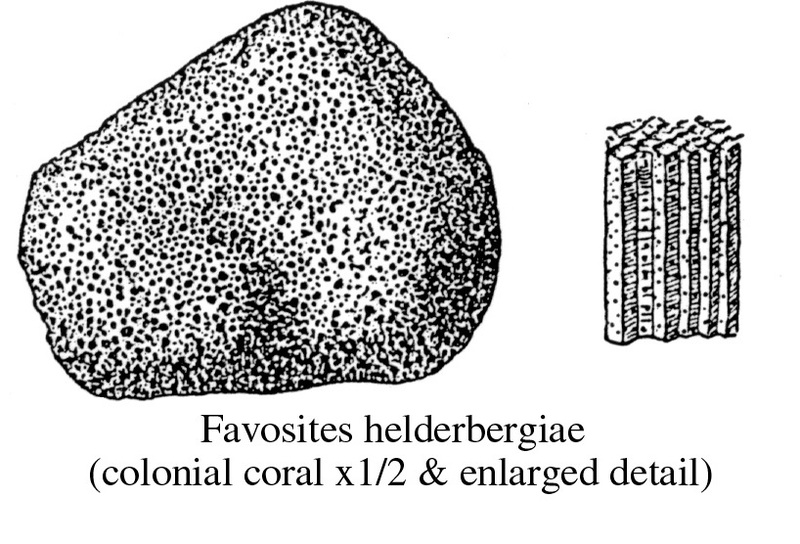 It looks more like this drawing of Favosites helderbergiae. 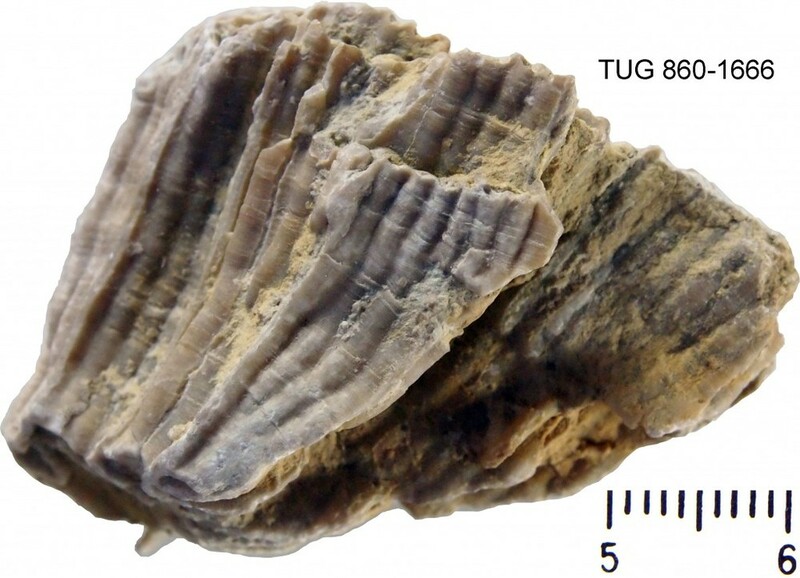 As far as the Strophomenid type brachiopod, I think that Cotistrophonella punctulifera is a good match. Don't forget, Grabau's work, while quite comprehensive, is old, and some names may no longer be in use, etc. Definitely not Halysites. Favosites sp. is how I would label it. F. helderbergiae would be strong possibility but there may be more than a few species in those rocks. When it comes to things like corals and bryozoans I am happy just to nail the genus. But F. helderbergiae is a strong contender and you can always label it as a best guess. Favosites spaeroidalis are spherical versus those fragments from a larger massive colony. PS I have been away from the Devonian almost ten years now living in the Cretaceous Seaway. I would have to dust off some books and regain my chops to really help on this one. I'm late, as always, caught in something else. Thank you for the picture, Dsailor.The reason why I asked the top view was that the corallites looked closed-packed, not in chain like distribution. Now is clear that it is Favosites, as Tim said way back. Well done Tim! Just for comparative reason here is Halysites catenularius . Also, there is visible in the side view, that the corallite walls are rounded not prismatic like in Favosites . No apologies necessary, Jay. We are all hear to learn. And you just taught someone something, by making us prove a point. No questioning would be a very dull existence here. We all make mistakes in ID'ing things. The point is to learn from it, and take it further next time. The person who is never wrong, never tries. I seem to be making a lot of ID mistakes lately... think I'm going to take a back seat for a while and go back to learning, lol. I have to do that from time to time as well. Oh, me too. We all do on occasion. And I have gone back after getting new reference material and reworked my identifications many times. My catalog is now a database and easily changed, but in the old days I learned to use pencil. One thing I also do is include the "Identification reference/source" in my catalog. That way I can go back and try to figure out why I may have labeled something one way instead of the other. And I have a "notes" field in the catalog to list special features or qualities as well as why I landed on a particular ID. But again, never feel that getting it only to the genus is a problem. For many researchers that is good enough. Good to know. From a layman standpoint it is pretty tricky as I am not a taxonomist by any degree. I mostly just build stuff and read a lot and then occasionally find fossils.